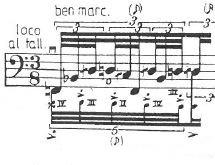 It is possible to create several polyrhythmic effects on the Double Bass. These effects are possible through a certain number of technical permutations. 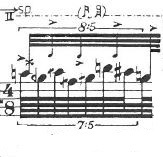 The polyrhythms can be of varying complexities but as the complexity increases, the polyrhythm can become more of a timbral multiphonic type effect will also emerge due to the variations in finger pressure when changing pitches. 1. Fingered pitches and conflicting arco rhythm on one string. Two handed percussive effects on instrument body.